We have given a rapid glance at the part which Washington took in the Revolution. He, as commander-in-chief, stands first. But he would have been quick to say that much of the credit for the success in that uneven struggle was due to the able generals who carried out his plans. Standing next to Washington himself as a military leader was Nathanael Greene. As you remember, the first fighting of the Revolution was in New England near Boston. Failing there, the British tried hard to get control of the Hudson River and the Middle States, as we have just seen. Again they were baffled by Washington. 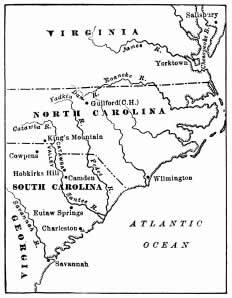 One course remained, and that was to gain control of the southern States. Beginning in Georgia, they captured Savannah. Two years later in May (1780), they captured General Lincoln and all his force at Charleston, and in the following August badly defeated General Gates, at Camden, South Carolina, where with a new army he was now commanding in General Lincoln’s place. The outlook for the patriot cause was discouraging. One thing was certain. A skilful general must take charge of the American forces in the south, or the British would soon have everything in their own hands. Washington had great faith in General Greene, and did not hesitate to appoint him for this hard task. Let us see what led the commander-in-chief to choose this New England man for duty in a post so far away. Nathanael Greene was born in Warwick, Rhode Island, in 1742. His father, who on week-days was a blacksmith and miller, on Sundays was a Quaker preacher. Nathanael was trained to work at the forge and in the mill and in the fields as well. He was robust and active and, like young George Washington, a leader in outdoor sports. But with all his other activities he was also, like young Samuel Adams, a good student of books. We like to think of these colonial boys going to school and playing at games just as boys do now, quite unaware of the great things waiting for them to do in the world. Had they known of their future, they could have prepared in no better way than by taking their faithful part in the work and honest sport of each day as it came. Greene, being ten years younger than Washington, was about thirty-two years old when the Boston Tea Party and those other exciting events of that time occurred. Although news did not travel so rapidly then as now, Greene was soon aware that war was likely to break out at any time, and he took an active part in preparing for it. He helped to organize a company of soldiers who should be ready to fight for the American cause, and made the trip from Rhode Island to Boston to get a musket for himself. In Boston he watched with much interest the British regulars taking their drill, and brought back with him not only a musket, hidden under some straw in his wagon, but also a runaway British soldier, who was to drill his company. When news of the battle of Bunker Hill passed swiftly over the country, proving that the war had actually begun, Rhode Island raised three regiments of troops and placed Greene at their head as general. He marched at once to Boston, and when Washington arrived to take command of the American troops, it was General Greene who had the honor of welcoming him in the name of the army.